The next meeting of the Anti-Racism Book Group is Thursday, May 2 at 7:30 PM in the Handley Library. (No meeting during April school vacation week). Our book selection is Black Like Me, by John Howard Griffin. (This book was first published in 1961 and there have been two editions since then.) There are several copies available via the Minuteman Library Network. Amazon also has many used copies. This link to a Smithsonian article about the author that was published in 2011. If you can tolerate all the ads, it’s a very interesting read. At our last meeting (White Fragility by Robin DiAngelo) there were a few people who hadn’t read the book, and everyone participated in a great discussion. So even if you don’t read the book – join us! All are welcome! The Deep South of the late 1950’s was another country: a land of lynchings, segregated lunch counters, whites-only restrooms, and a color line etched in blood across Louisiana, Mississippi, Alabama, and Georgia. White journalist John Howard Griffin, working for the black-owned magazine Sepia, decided to cross that line. Using medication that darkened his skin to deep brown, he exchanged his privileged life as a southern white man for the disenfranchised world of an unemployed black man. 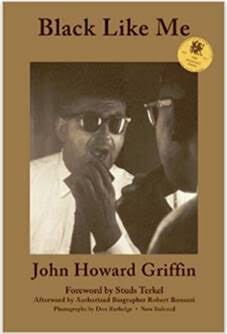 What happened to John Howard Griffin–from the outside and within himself–as he made his way through the segregated Deep South is recorded in this searing work of nonfiction. Educated and soft-spoken, John Howard Griffin changed only the color of his skin. It was enough to make him hated…enough to nearly get him killed. . His odyssey of discovery was captured in journal entries, arguably the single most important documentation of 20th-century American racism ever written. His audacious, still chillingly relevant eyewitness history is a work about race and humanity every American should read.